Extensive building work is set to continue until the winter opening date. 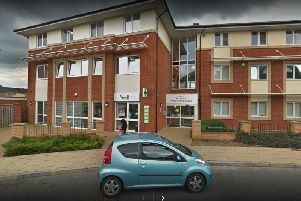 Hundreds of online reviewers have slammed a new bank heading to Northampton town centre as 'bad'. Metro Bank has this week confirmed to the Chronicle & Echo that it will be opening a new branch in Abington Street, next to the Grosvenor Centre entrance, creating 25 new jobs. In order to accommodate Metro Bank, shopping centre owners Legal & General agreed to demolish the canopies covering the Abington Street entrance when it was granted planning permission. But the bank - that controversially uses text messages to verify its online customers contrary to critics - has left a bad taste in customers' mouths. In total, 73 per cent of 227 reviewers on Trust Pilot have rated the bank as 'bad' with customers telling of how money was wrongly withdrawn from their account by fraudsters. Pramod Rai said: "On numerous occasions, monies from my account were withdrawn by the fraudsters. I have experienced this issue only with Metrobank and not with any of the other banks. "The amounts, which were withdrawn, were in the ranges of £900, £200, £500 on multiple occasions. I will avoid such bank where my hard earned monies are not safe and secure." In February this year the Guardian reported how a UK businessman had fallen victim to sim-swap fraud. Paul Graham lost £20,000 after fraudsters drained his Metro bank balance by hacking into his phone account and setting up a series of new online payments. Other reviewers, including reviewer Maximilien Letek said: "The worst business bank ever. Don't hold your breath for simple business services such as an overdraft. Fees are extortionate and generally, I would not recommend this bank for start-ups or small businesses." Alex N said: "After reading all the reviews on here, I decided to close my account and transfer to a main high street bank. "I liked the idea of supporting a smaller bank, but what with people having their accounts frozen, for seemingly no reason, and the fact my nearest branch is 300 miles away, I thought better of it." However, 18 per cent of reviewers voted the service as good, one per cent voted the service as great, two per cent said the bank was average and seven per cent rated the service poor. Cosmin Stefan gave the bank five stars. He said: "I don't have any idea why they have such a low rating on Trust Pilot, this is the best bank I [have] ever used!" A Metro Bank spokesperson said: “At Metro Bank we believe in providing our customers with the very best banking experience however, whenever and wherever they choose to bank. "One of the channels we’re proud to invest in is our stores. "Open early-to-late, seven days a week, 362 days a year, our stores enable us to provide business and personal customers with traditional face-to-face relationship banking, supported by state-of-the-art technology. “For us, stores aren’t just a place to do your banking in, they also provide tangible benefits to local people. "So, whether it’s being able to print a new or replacement debit or credit card on-the-spot, offering safe deposit boxes to store your valuables in, being able to count your change for free, or even hosting networking, charity and financial education sessions; our stores play a vital role in helping make customers’ lives easier."